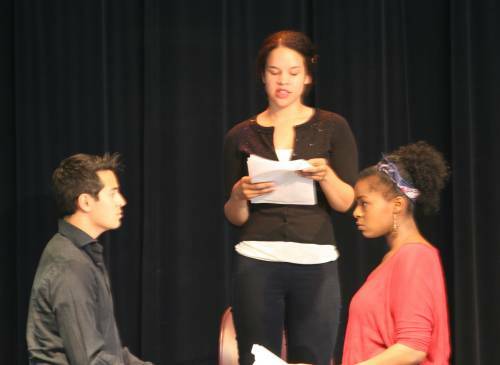 The Young Playwrights Festival features professional actors performing the best student plays culled from spring classes at Mercer Middle School and South Shore School. The plays tackle tough topics and other worldly ideas, explore the Civil War and Greek history, in ways that are funny, moving and smart. A question and answer session with the student playwrights follows the performance. Student playwrights have worked on the craft of playwriting all spring, in an in-school arts residency taught by drama professionals. Through writing and performance exercises, each student develops, writes and revises his or her own one-act play. Students’ plays are then read by a panel of theatre professionals, and the best are selected for staged readings. Professional actors bring these plays to life on stage at the Rainier Valley Cultural Center. Each year brings surprises and delights – last year, a re-imagined version of The Wizard of Oz brought down the house, and students are still talking about it. This year, plays are filled with themes of freedom and independence. Thanks to the Washington State Arts Commission and Fales Foundation, the 2012 festival features a new community preview! On Tuesday, June 12, Columbia City’s Bookworm Exchange hosts a special set of preview readings. Student actors will join with professionals to share excerpts of exceptional plays. Drew Hobson, RVYT Teaching Artist at South Shore, states: “I got to tell one of my playwriting students that I believe in him. He kept insisting that he doesn't have an imagination. And I told him (and then the whole class) that I grew up in the Central District. Gangs, drugs, shootings, I've seen it all. But I had someone when I was their age show me how to use my imagination to free myself from my surroundings. That's why I LOVE doing what I do, having the chance to tell them if I did it, so can they. I could see on his face and in the rest of the class that I was getting across to them. Encouraging a child's imagination unlocks an infinite amount of doors in their future. ‘I believe in you’: four words that can change a child's life."